Crochet Crowd Selfies from our Fans. Concept created by our Cathy. Yesterday, our very own Cathy created a new concept. It’s called #crochetcrowdselfies. I love when Cathy takes ideas and runs with it. I had no idea this was coming and/or even what it involved. 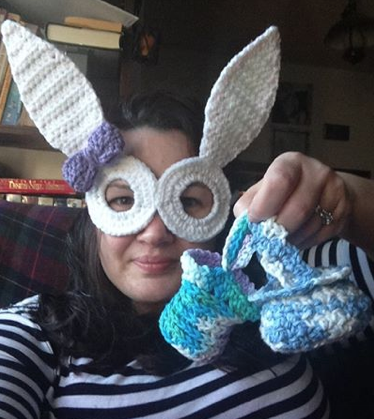 Crochet Crowders joined in the fun by posting their very own #crochetcrowdselfies yesterday and oh boy what fun. In one photo, Megan is hooking in the sun in a lawn chair, meanwhile at home I am bundled up in a sweater. I was jealous! I love seeing our fans doing what they love. We are always so busy to share our WIPS and final projects but we rarely take photos of ourselves in the moment. So following Cathy’s lead, let’s continue this trend of sharing a photo or two of yourself hooking. Be sure to put #crochetcrowdselfies in your descriptions. This entry was posted in Announcements and tagged #crochetcrowdselfies, Crochet, crochet crowd, Fan Photos, Hooking, Learn to Crochet, Mikey, Pictures. Bookmark the permalink. Hmmm. Bang on, Mikey. And going out to lunch is always better than ordering in. LOL. You are endearing, funny and a great teacher. But I do have to say that too much candor is not always appreciated so much by corporate sponsorship. It is tough to run your own business. There will always be people who will tell you why you can’t do something, you’re not qualified, you’re not smart enough, you’re not big enough or you’re not fast enough. The reason why they tell you that you can’t do it is because THEY can’t do it. Never give up on your dreams and goals. how is this done? and where? It was on facebook. Go to their psge to upload a selfie. It was fun.